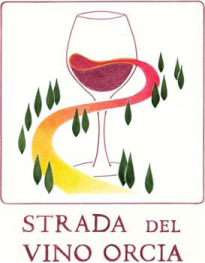 The “Strada del Vino Orcia” was born in 2003 and has its office in the hamlet of Rocca d’Orcia in Castiglione d’Orcia. You can experience the authentic Val d’Orcia thanks to winery tours, walking in the vineyards and wine tastings paired with “bruschette”, bread with Extra Virgin Olive Oil, tasty local cheese and cold cuts. Staying in the beautiful farmhouses scattered among the rolling hills you can discover the Val d’Orcia and its features: for those who would like to experience the atmosphere in the wineries of the “Strada del Vino Orcia” during the grape harvest, these are the ideal places. You can also enjoy the Orcia wines at wine bars and restaurants visiting the artistic towns of the area, going shopping in the artisans’ workshops or directly going to the wineries.